“An ‘inclusive’ education system can only be created if ordinary schools become more inclusive … if they become better at educating all children in their communities… ‘regular schools with [an] inclusive orientation are the most effective means of combating discriminatory attitudes, creating welcoming communities, building an inclusive society and achieving education for all (UNESCO, 2009). Cognitive differences are largely misunderstood by educators because the brain is a complex and hidden organ. This has meant that successful inclusion of learners with cognitive disabilities into community schools has been slow and often challenging. The lecture begins by discussing cognitive diversity affecting all of us. When cognitive differences interfere with our everyday functioning, specific learning disabilities may be diagnosed. When learning disabilities are generalised, intellectual disability is diagnosed. Children with intellectual disability, like their peers, require appropriate cognitive challenges to stay engaged in the classroom. The question of optimal challenge can be tricky. The lecture will explore how teachers might decide when to teach and when to compensate for a learner’s cognitive difficulty. 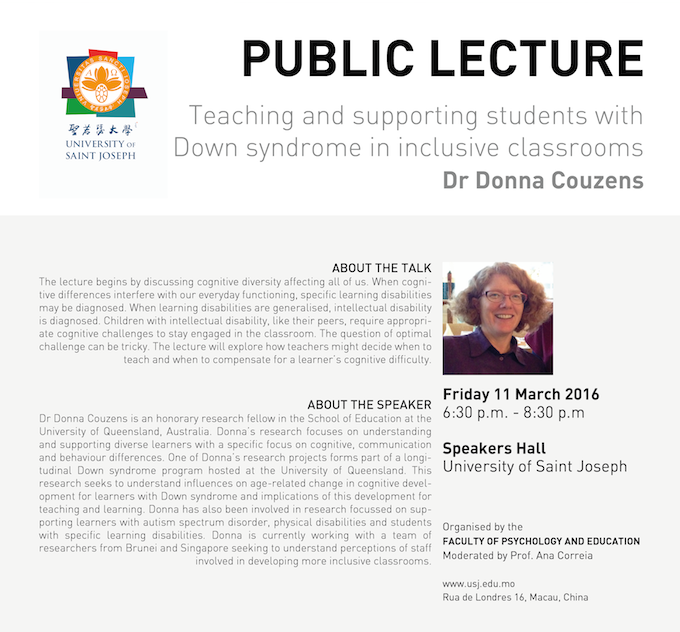 Dr Donna Couzens is an honorary research fellow in the School of Education at the University of Queensland, Australia. Donna’s research focuses on understanding and supporting diverse learners with a specific focus on cognitive, communication and behaviour differences. One of Donna’s research projects forms part of a longitudinal Down syndrome program hosted at the University of Queensland. This research seeks to understand influences on age-related change in cognitive development for learners with Down syndrome and implications of this development for teaching and learning. Donna has also been involved in research focussed on supporting learners with autism spectrum disorder, physical disabilities and students with specific learning disabilities. Donna is currently working with a team of researchers from Brunei and Singapore seeking to understand perceptions of staff involved in developing more inclusive classrooms.